This weekend, Leslie & Jason will trek up north to the icy land of Minneapolis to warm up the place with explosive performances (figuratively speaking; no actual explosions will occur, hopefully). On Friday the 22nd at 7:30 PM, they'll bring their live cinema performance to Art of This, crowned "Best Art Gallery of 2009" by Minneapolis City Pages. 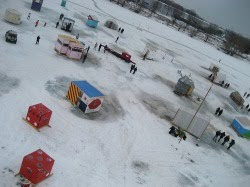 Then Saturday the 23rd at 1 PM, they'll perform on Medicine Lake (yes, on) as part of the Art Shanty Project, specifically as guests inside the Fanta Shanty. This is PBL's half of a bargain struck with the Art Shanty folks, in which PBL dared them to participate in Contemporary Art Month. Art Shanty director David Pittman & artist Stephen Rife came to San Antonio in July 2008 and sweat up a storm putting on a couple outdoor video screenings and a pyrotechnic performance... so now it's PBL's turn to go up there and freeze their butts off bringing live cinema where few dare step: the middle of a lake.